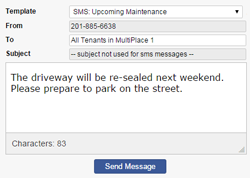 Keeping in touch with your tenants, owners, and vendors is easier than ever with the built-in messaging capabilities. Rentec Direct streamlines the process with the email and text messaging interface. You can create single-use messages or schedule the delivery of message to coordinate with seasonal maintenance reminders or rent due dates. You can also automatically notify tenants when new charges are posted, payments are received, or if their account is late. Why electronic communication with tenants is more important than ever.